In 2007, responsible foam producers in the U.S. were concerned about substandard foams being imported into this country. It was suspected that many of these foams were made with chemicals that were banned in the United States and which were identified on some chemical watch groups’ lists as possibly causing cancer, genetic defects, or damage to the unborn child. There was no way for consumers to know what was inside foam used in bedding and upholstered furniture. The CertiPUR-US® program was developed to provide the comfort and confidence of knowing the flexible polyurethane foam meets standards for content, emissions and durability and are analyzed by independent, accredited laboratories. 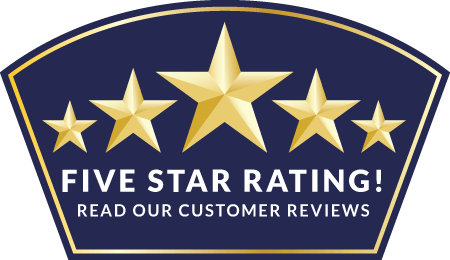 The Technical Guidelines provide complete details on the certification process and were established with guidance from the global foam industry and in conjunction with the leadership of the mattress and upholstered furniture industries. In addition, an advisory panel of scientists, academics, environmentalists and representatives of consumer groups provided invaluable input in the development process. All certified flexible polyurethane foams are tested and analyzed twice in the first year, and re-certified annually thereafter. In addition, we conduct random on-site foam production plant checks of participating foam producers. Ozone’s presence is important in our upper atmosphere, where it provides a shield from the sun’s radiant energy. The Montreal Protocol, adopted in 1987, mandated that industries eliminate ozone depleting chlorofluorocarbons (CFCs) by the year 2000. U.S. foam producers were well ahead of schedule in complying with this regulation. Unfortunately, in some parts of the world, CFCs are still used to manufacture foam. The CertiPUR-US label prohibits the use of any CFCs, or other ozone depleters, in the foam manufacturing process. Some PBDEs (polybrominated diphenylethers) were used in foam to meet certain state flammability requirements, but those PBDEs were effectively banned in the U.S. by the Environmental Protection Agency (EPA) in 2005. Other flame retardants that have been identified by the Globally Harmonized System (GHS) as substances that may cause cancer, may cause genetic defects or may damage fertility or unborn child (1A, 1B) may not be used in certified foam. TDCPP or TCEP (“Tris”) are among these FRs. A complete list of specific FRs prohibited in certified foam may be found in our Technical Guidelines or at certipur.us/FAQ. Though not common components of foam chemistry, heavy metals in food (mercury in fish) and in the home (lead paint in children’s toys) have made the entire heavy metal family an area of concern. CertiPUR-US laboratory testing subjects material extracted to molecular analysis capable of detecting even trace amounts of heavy metal content. CertiPUR-US verifies that registered foams are made without mercury, lead and other heavy metals. Like heavy metals, formaldehyde has never been used as a raw material in foam. Formaldehyde has been labeled as a cause of poor indoor air quality. The absence of formaldehyde in foam is verified in CertiPUR-US-certified foam by a small chamber emission test. Phthalates (pronounced “thal’-ātes”) are mainly used as a softening agent in the manufacture of some consumer products. The Consumer Product Safety Improvement Act (2009) eliminated the use of seven specific phthalates for use in children’s toy and child care items. 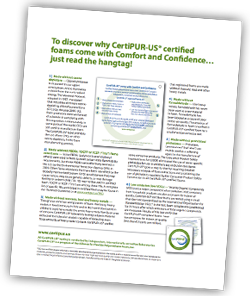 CertiPUR-US goes a step further by requiring detailed laboratory analysis of foam extractions and prohibiting the use of phthalates regulated by the Consumer Product Safety Commission in all CertiPUR-US certified foams. Volatile Organic Compounds (VOCs) are a major component of air pollution. VOC emissions from household products are also a concern for indoor air quality. CertiPUR-US certified foams are tested using a small chamber test standardized by the International Organization for Standardization (ISO). * In the test, foam samples are conditioned for 72 hours after which emissions of total organic compounds are measured. Results of this test verify that CertiPUR-US compliant foams have low emissions for indoor air quality (less than 0.5 parts per million). *ISO is one of the largest voluntary standards development organizations in the world, and is a trusted source for technical standards for materials, products, systems, and services. Known for their high technical quality and market relevancy, ISO standards have an important role in the technical infrastructure that guides design, manufacturing and trade in the global economy.